Discussion in 'Pregnancy - First Trimester' started by Wobbles, May 11, 2007. I measure 8.1 weeks! Is that the same as you Layla? Heartbeat was seen & the blood flow or something?! I have to ring my MW for a booking appointment next & get a dating scan. Now will you stop stressing? lol you need to relax a bit now, id say you pretty safe coz your over the 6 week mark. Got any pics??? im dieing to see! its cool we have the same due date! is it like a bean shape, or can you see arms and legs? Damn Jase! looks like im in for another big baby, grrr! 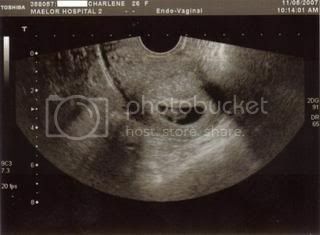 My sisters 8 weeks scan is silmar to that, like a kidney bean shape. Congrats hun glad all is well, bet your looking forward to dating scan!! Fantastic - Really chuffed everything went well - I know you won't relax completely, but I hope you can relax a little now. Congratulations - You are going to be a Mommy! Im so pleased all went well hun! ooooooh yay!!!!!! now as layla sed.... stop stressing and start enjoying your pregnancy!!!!! Wayhey!!! What a lovely clear picture as well! So pleased to hear that all is well. Have they given you a date for your 12 week scan? I think my 7 week pics were clearer than my 10 week pics, rather blobby looking then, but incredible how much they had grown in just those few weeks. How you doing during the scan? I've only just got to the point where I don't cry cos it's so wonderful to see them. Silly moo, I know!